This, my second day's ride in Turkey, is as enjoyable and picturesque as my first, and I arrive in Torbali at 4 in the afternoon. Apparently not too many bicyclists pass through Torbali in December, for I am a hit. Adopted by two local boys, I am proudly led around, first to the 'otel' where I lock my bike in the upstairs hallway, then to a beer-bar where everyone buys me beers and crowds around to practice their English. After a few hours I manage to break away and return to the hotel where I grab warmer clothes, my journal, and a cassette tape of rock music. I also prepay my bill-55cents for one of the dormitory style beds in a sleazy room. I head back out to eat and write, but writing's impossible-I'm obviously a foreigner, and I am once again surrounded by well-wishers who watch me eat, pay for my dinner, buy me beers, and practice their English. After dinner I am hustled off to another bar where I meet the town mayor and other politicos, drink more beers, and later, after some of the crowd leaves, hear my cassette tape on the bar's system. Another memorable image: Turkish men in a Turkish bar dancing around a pot belly stove to Cindy Lauper and Boy George! 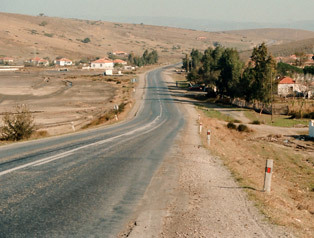 The next morning, my head pounding, I begin riding towards Izmir, 43 kilometers distant. The mornings seem to be getting colder and I'm wearing all my shirts at once. My bluish fingers peaking out from my riding gloves distract my attention from my exposed legs. I'm in Izmir just after noon, and after fast paced city-jam to a hotel on the far end of town I settle down to write postcards and catch up in my journal. My map shows the next reasonably-sized town to the north to be 106 kilometers distant and I decide to crash early. 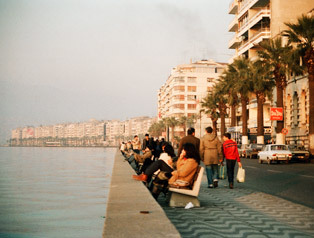 Izmir was a much larger city than I expected, and the waterfront was quite impressive.